By Dan Conifer and Sophie Scott. Australians crippled by mental illness will receive individual care plans as part of a Federal Government overhaul of the multi-million-dollar sector. An online and telephone one-stop-shop will be established directing people to appropriate services, as the Government abandons the current “one-size-fits-all” approach. People with severe and complex needs will have access to an “integrated care package”, including psychological services, mental health nursing, along with drug and alcohol services. “We are setting out a blueprint for reform that puts the individual at the centre of our mental health system,” Prime Minister Malcolm Turnbull said. The changes will also provide extra funding for Indigenous mental health and see Primary Health Networks commission the services needed by mentally ill people in their regions. Overall funding will not be increased, with the Federal Government currently spending about $10 billion on mental health each year. “It’s vital that we do so in a way that … puts the individual, the patient at the centre, that gives real choice and contestability,” Prime Minister Malcolm Turnbull said. The Government will establish a single mental health hotline to direct people to appropriate services, after the review found more than 30 Government-supported phone and online mental health services. A “stepped care” model will see people receive varying levels of care depending on their needs. “It means at whatever step you are on, you receive the help that you need and you don’t knock on a lot of doors before you find it,” Health Minister Sussan Ley said. The Government said individual funding plans would be similar to the National Disability Insurance Scheme model. The Government’s 31 Primary Health Networks will commission services they consider needed in their communities. “What we have now is a fragmented, poorly structured … system,” Ms Ley said. As revealed by the ABC, the Government will provide more funding for Aboriginal and Torres Strait Islander communities, with $85 million will go towards Indigenous mental health over three years. The changes will be rolled out over three years from 2016. 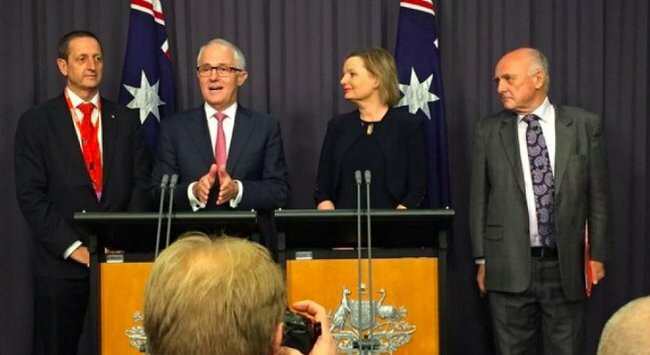 Ian Hickie, who was part of the major review of the mental health sector that led the Government’s reforms, said the change in leadership from Tony Abbott to Mr Turnbull had sped up the response. “I think he direct personal involvement of the new Prime Minister is critical,” Professor Hickie said. “[It] is indicative that this is where the Turnbull Government wants to go. The mental health sector is particularly pleased the Government has listened to calls for a “stepped care” approach to mental health services, giving each patient individualised support and ensuring people receive adequate levels of care. “Reform starts today,” Mental Health Australia chief executive Frank Quinlan said. Black Dog Institute director Helen Christensen said the Government had acknowledged mental health programs need to be fully integrated into day-to-day life. “A key component of the stepped care mental health released by Government today is to provide mild to moderate care through a digital portal — offering e-therapies, help lines and self-help programs,” she said. But Professor Christensen said the sector was disappointed that the Government had not taken a stronger approach to suicide prevention. “Every day, around seven Australians take their own lives. With this serious health issue, considerable evidence-based programs are available to be rolled out immediately,” she said. The Government’s response comes more than a year after it received a scathing review of the sector from the National Mental Health Commission.